North Korean state media has announced that military chief Ri Yong-Ho has been removed from all official posts. As well as being head of the army, Ri Yong-Ho was vice-chairman of the powerful Central Military Commission and held top posts in the ruling Workers’ Party. In a short statement, the party said Ri Yong-Ho had been removed from his posts “because of illness”. However, there is widespread skepticism about that explanation. The decision to relieve Ri Yong-Ho of his duties came at a meeting of the Workers’ Party Central Committee politburo on Sunday, state-run news agency KCNA said. The brief report made no mention of a successor. In Seoul, a spokesman for the Unification Ministry told reporters that the move was “very unusual”. “It’s quite a rare case that the North promptly and publicly announced early this morning the outcome of a meeting yesterday, on 15 July. We will keep monitoring closely,” Kim Hyung-suk said. Ri Yong-Ho was made army chief three years ago under Kim Jong-Il, the current leader’s father who died in December 2011 after ruling North Korea for almost two decades. 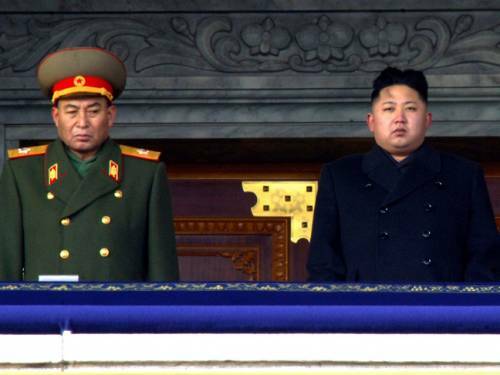 The army chief regularly appeared at state occasions beside Kim Jong-Il. He was also one of seven top officials to accompany the younger Kim as he followed the hearse containing his father’s body at his state funeral. Ri Yong-Ho was widely thought to be a figure in the inner circle of the new leader and instrumental in helping him cement his position. His removal is now being scrutinized by analysts for signs of the direction in which Kim Jong-Un, seen as young and inexperienced, will take the country. The army and Workers’ Party are the two primary institutions that bolstered the Kim family dynasty, said Robert Kelly, a professor at the Pusan National University in South Korea. Kim Jong-Un did not serve in either of those two institutions which are ”traditional proving grounds and grooming grounds… for the leadership in the system”. ”So his position is very vulnerable because he does not know the generals and colonels who prop up the state,” said Dr. Robert Kelly. In April North Korea defied international warnings to launch a rocket – an action its neighbors called a long-range missile test that contravened UN resolutions. South Korea also warned earlier this year that Pyongyang appeared to be in the late stages of preparing for a third nuclear test – a claim North Korea has denied. International talks aimed at ending North Korea’s nuclear ambitions have been stalled since 2009.